Gday guys. Since selling my house and currently building a new one which is a couple of months away, I have decided to start planning a new track which I have immensely missed owning. The thing I am going to do this time is to build it modular so that if I move again I can take the track with me. Further, I would like to add modules when needed to change the design of the track ever so slightly to add a little bit of interest. The track will be 4 lanes (talk me out of 5 someone?) and be used for club racing, if the guys want to come. One of the things I really like about simple tracks is the racing element is enhanced. Cars are closer together for longer periods of time which aids in the enjoyment I have in slot car racing. Haven't settled on a design as yet but one of the options I will have is below. Looks similar to my last track but this configuration will have 110mm lane spacing with 1/4" braid to allow for 1/24 scale cars. I like what Mr Trax has done in the following link. Track pieces can be added at will. I prefer the Mr Trax method of legs but I guess the adjustability is a little more difficult using these. Anyone with experience with both types more than welcome to comment as I would love to hear. The garage is 8m x 7 so a decent space to build a track. As the track will be able to be pulled apart I am going to have a configuration which will use up a LOT of that space. Anyway, I thought I would keep a journal of the design phase, build etc as I have noticed a fair drop off of activity here, particularly in the track building stage. Also useful for others wishing to jump in and build a track to learn from my mistakes. Would greatly appreciate any input or comments you might have. PS. Forgot to add, in my work I deal regularly with joiners and so have ready access to CAD / CNC facilities and the guy we use is happy to draw it up and route for me. I won't miss the dust! I like the modular idea myself and plan to build a modular track someday (hopefully soon) - while I don't miss running on plastic track I do sometimes miss the flexibility of being able to change the layout. 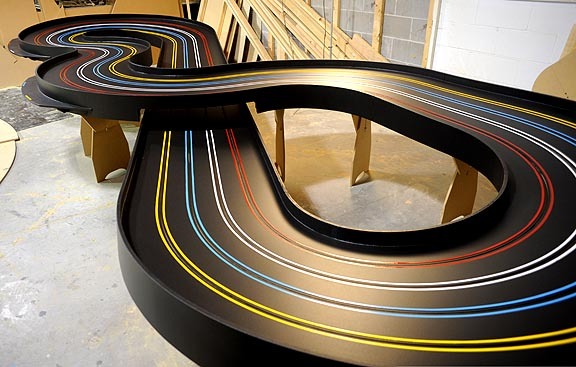 I have had a look at the J-Trak modular on slotforum - which while it is for scalextric track still gives good ideas. I have also checked out the slotfire modular tracks. Edited by dangermouse, 08 March 2019 - 06:25 PM. Best news I've had all week!! Like it John, would work in both directions, 2 tracks in 1!! Yeah nice to have a track to tune on and another race track for the group. That configuration will be one of 4 I have plans i my head for. Change a piece her and there and a new track is born. Will get a start of sketching up what I want and will post here. Finally got your new garage Mate. Maybe you could do some type of joins like Rick used on his track? re-modular track, David from BLST did some modular track designs on SF, so maybe worth a look for ideas.